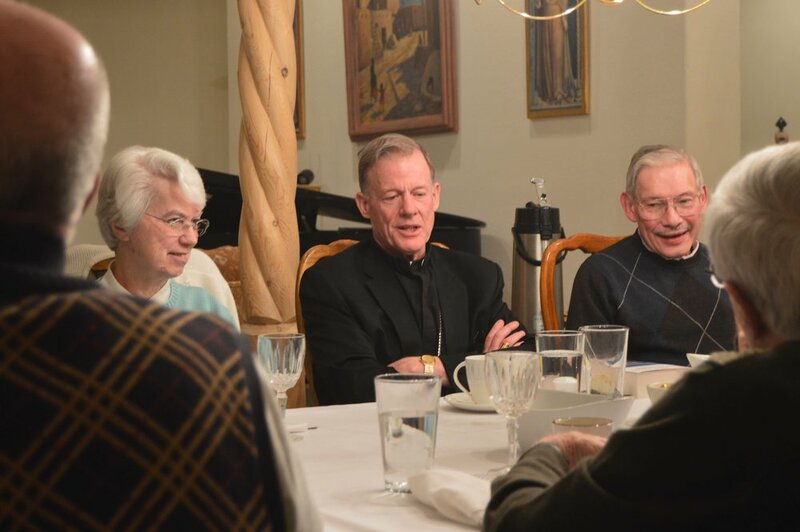 Santa Fe Archbishop John Wester discusses plans for the 2018 AUSCP Assembly, over dinner at his home in Albuquerque, June 24. He is flanked by Sister Jackie Deeper OSF, executive secretary of the AUSCP, and Father David Cooper, past chair of the association's leadership team. Archbishop Wester will welcome participants and preside at the assembly Mass, during the June 25-28 event in Albuquerque. Scheduled to give keynote addresses are Sister Katarina Schuth, Bishop Robert McElroy and Father Richard Rohr -- who will also present a one-day retreat for registered participants. Newer Post"Let laity lead parishes . . . . "